The regional or national assessment of groundwater quality is vital when planning to exploit groundwater for drinking purposes. Especially in developing countries, detailed surveys on groundwater quality are often lacking or incomplete. Therefore, there is a demand for tools capable of assessing groundwater quality on larger scales, for example to identify hot-spots for geogenic contamination. Using GIS methods, it is possible to model the probability of groundwater being contaminated by arsenic or fluoride on large scales (regional and global). This approach combines raster data containing layers on geology, hydrology, soil types, climate and land use with point measurements of fluoride or arsenic in groundwater to investigate the possible relationship between these parameters. The results are depicted as risk maps showing the probability of fluoride/arsenic contamination in a certain region. In order to make a preliminary assessment of the risk of geogenically contaminated groundwater, we need to identify hot-spots for contamination. 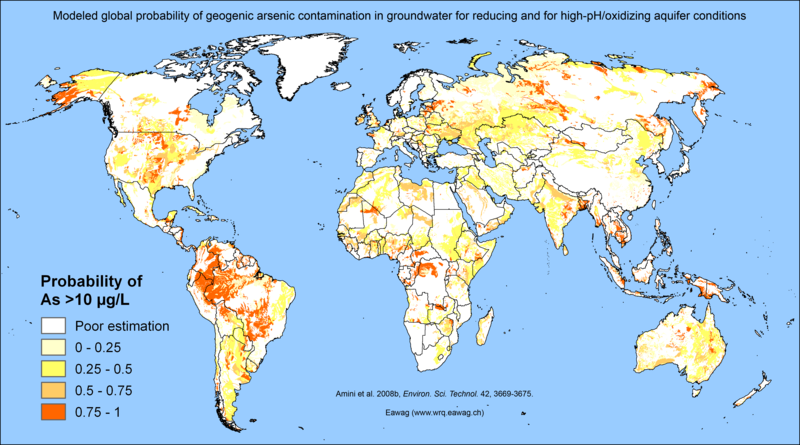 Around the world arsenic-polluted groundwater, contaminated by natural geogenic sources, is used for drinking water and irrigation purposes. In China it is estimated that over 5 million people are affected to date and arsenicosis has been identified in 9 provinces. Long-term exposure to arsenic can affect human health and is considered to be a significant environmental cause of cancer. 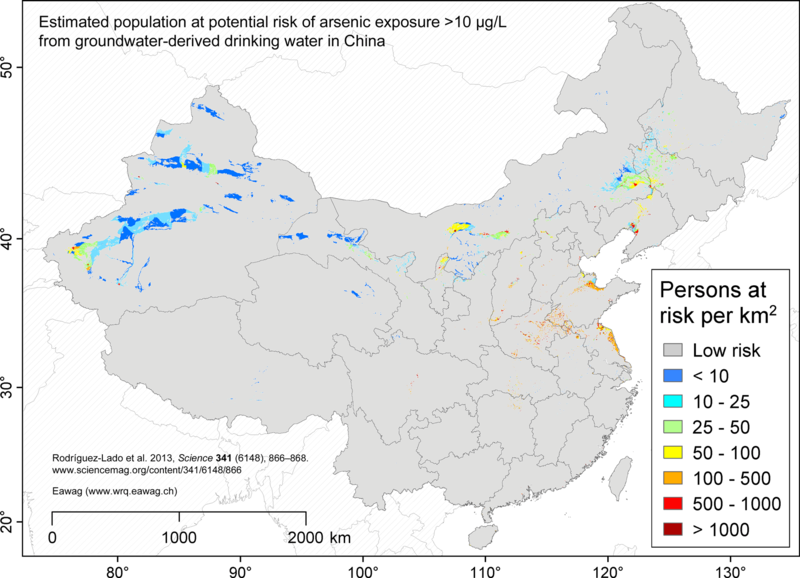 Exposure to high levels of arsenic in drinking water has been attributed to the gradual improvement of living standards in rural China. Since the economic reforms began in 1978, many peasants have been able to afford to drill wells 20-30m deep fitted with hand pumps in their homes rather than using microbially contaminated saline, fluoride rich shallow-wells or surface water. The capability of predicting arsenic contamination will greatly simplify the task of identifying arsenic-contaminated groundwaters. 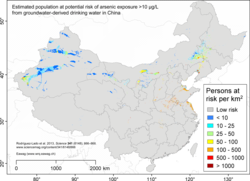 The aim of the research project is to obtain an in-depth understanding of the causes of groundwater contamination with arsenic in the arid regions of China and to develop risk maps that can be used both to rationalise the identification of risk areas and to improve on global arsenic risk maps. 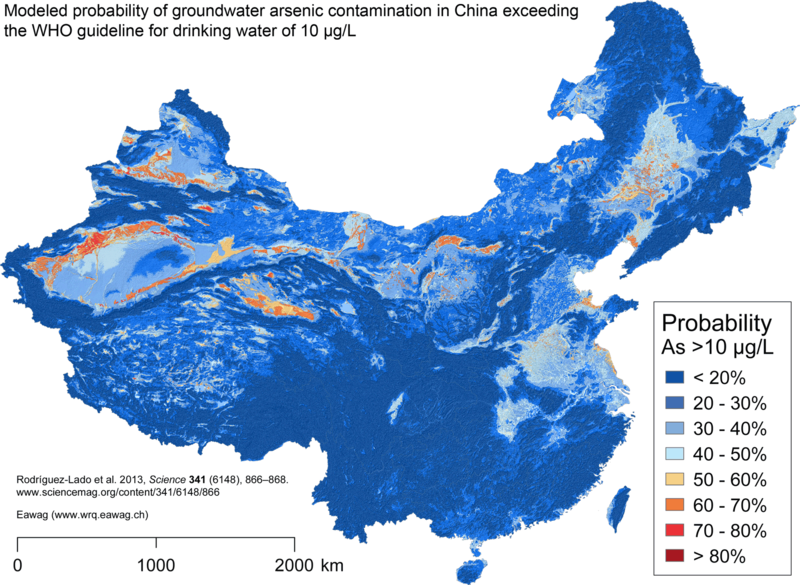 We combine georeferenced groundwater field observations provided by our partners from China with a number of environmental auxiliary variables to understand the mechanisms that underlie the release of arsenic to develop a valuable risk model for China. We compiled up to 26 different environmental auxiliary variables in the form of raster maps at both 1 and 5 Km resolution. They include climatic and topographic variables, satellite images, gravity maps and hydrological and geological information. 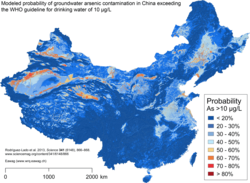 We use Geographic Information Systems (GIS) coupled to a statistical programming environment (R) to create models explaining the distribution of high arsenic concentrations in groundwaters of the northern provinces of China. At present, field information for the provinces of Inner Mongolia, Gansu and Shanxi has been compiled. These models will allow us to understand the geochemical and hydrological processes that control arsenic mobility in arid regions. The use of groundwater with high fluoride concentrations poses a health threat to millions of people around the world. This study aims at providing a global overview of potentially fluoride-rich groundwaters by modeling fluoride concentration. A large database of worldwide fluoride concentrations as well as available information on related environmental factors such as soil properties, geological settings, and climatic and topographical information on a global scale have all been used in the model. 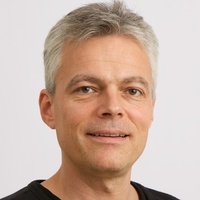 The modeling approach combines geochemical knowledge with statistical methods to devise a rule-based statistical procedure, which divides the world into 8 different “process regions”. For each region a separate predictive model was constructed. 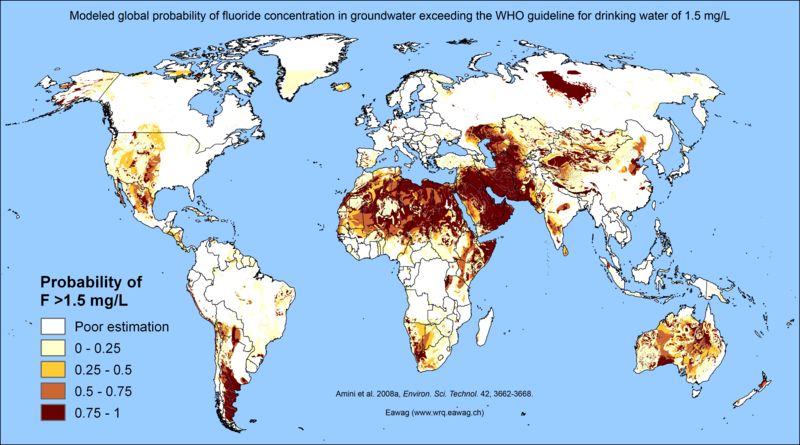 The end result is a global probability map of fluoride concentration in the groundwater. Comparisons of the modeled and measured data indicate that 60−70% of the fluoride variation could be explained by the models in six process regions, while in two process regions only 30% of the variation in the measured data was explained. Furthermore, the global probability map corresponded well with fluorotic areas described in the international literature. Although the probability map should not replace fluoride testing, it can give a first indication of possible contamination and thus may support the planning process of new drinking water projects. Contamination of groundwaters with geogenic arsenic poses a major health risk to millions of people. Although the main geochemical mechanisms of arsenic mobilization are well understood, the worldwide scale of affected regions is still unknown. In this study we used a large database of measured arsenic concentration in groundwaters (around 20,000 data points) from around the world as well as digital maps of physical characteristics such as soil, geology, climate, and elevation to model probability maps of global arsenic contamination. A novel rule-based statistical procedure was used to combine the physical data and expert knowledge to delineate two process regions for arsenic mobilization: “reducing” and “high-pH/oxidizing”. Arsenic concentrations were modeled in each region using regression analysis and adaptive neuro-fuzzy inferencing followed by Latin hypercube sampling for uncertainty propagation to produce probability maps. The derived global arsenic models could benefit from more accurate geologic information and aquifer chemical/physical information. Using some proxy surface information, however, the models explained 77% of arsenic variation in reducing regions and 68% of arsenic variation in high-pH/oxidizing regions. The probability maps based on the above models correspond well with the known contaminated regions around the world and delineate new untested areas that have a high probability of arsenic contamination. Notable among these regions are South East and North West of China in Asia, Central Australia, New Zealand, Northern Afghanistan, and Northern Mali and Zambia in Africa. Arsenic contamination of groundwater resources threatens the health of millions of people worldwide, particularly in the densely populated river deltas of Southeast Asia. Although many arsenic-affected areas have been identified in recent years, a systematic evaluation of vulnerable areas remains to be carried out. Here we present maps pinpointing areas at risk of groundwater arsenic concentrations exceeding 10 g l-1. These maps were produced by combining geological and surface soil parameters in a logistic regression model, calibrated with 1,756 aggregated and geo-referenced groundwater data points from the Bengal, Red River and Mekong deltas. We show that Holocene deltaic and organic-rich surface sediments are key indicators for arsenic risk areas and that the combination of surface parameters is a successful approach to predict groundwater arsenic contamination. 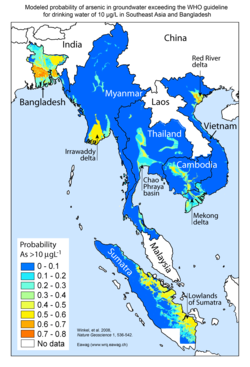 Predictions are in good agreement with the known spatial distribution of arsenic contamination, and further indicate elevated risks in Sumatra and Myanmar, where no groundwater studies exist.